The origins of the earliest constellations likely go back to prehistory. People used them to relate stories of their beliefs, experiences, creation, or mythology. Different cultures and countries adopted their own constellations, some of which lasted into the early 20th century before today's constellations were internationally recognized. Adoption of constellations has changed significantly over time. Many have changed in size or shape. Some became popular, only to drop into obscurity. Others were limited to single cultures or nations. The 48 traditional Western constellations are Greek. They are given in Aratus' work Phenomena and Ptolemy's Almagest, though their origin probably predates these works by several centuries. Constellations in the far southern sky were added from the 15th century until the mid-18th century when European explorers began traveling to the Southern Hemisphere. Twelve ancient constellations belong to the zodiac (straddling the ecliptic, which the Sun, Moon, and planets all traverse). The origins of the zodiac remain historically uncertain; its astrological divisions became prominent c. 400 BC in Babylonian or Chaldean astronomy, probably dates back to prehistory. In 1928, the International Astronomical Union (IAU) formally accepted 88 modern constellations, with contiguous boundaries that together cover the entire celestial sphere. Any given point in a celestial coordinate system lies in one of the modern constellations. Some astronomical naming systems include the constellation where a given celestial object is found to convey its approximate location in the sky. The Flamsteed designation of a star, for example, consists of a number and the genitive form of the constellation name. Other star patterns or groups called asterisms are not constellations per se but are used by observers to navigate the night sky. Examples of bright asterisms include the Pleiades and Hyades within the constellation Taurus or Venus' Mirror in the constellation of Orion.. Some asterisms, like the False Cross, are split between two constellations; others, like the Summer Triangle, share stars across several constellations. The word "constellation" comes from the Late Latin term cōnstellātiō, which can be translated as "set of stars"; it came into use in English during the 14th century. The Ancient Greek word for constellation is ἄστρον. A more modern astronomical sense of the term "constellation" is simply as a recognisable pattern of stars whose appearance is associated with mythological characters or creatures, or earthbound animals, or objects. It can also specifically denote the officially recognized 88 named constellations used today. Colloquial usage does not draw a sharp distinction between "constellations" and smaller "asterisms" (pattern of stars), yet the modern accepted astronomical constellations employ such a distinction. E.g., the Pleiades and the Hyades are both asterisms, and each lies within the boundaries of the constellation of Taurus. Another example is the northern asterism known as the Big Dipper (US) or the Plough (UK), composed of the seven brightest stars within the area of the IAU-defined constellation of Ursa Major. The southern False Cross asterism includes portions of the constellations Carina and Vela and the Summer Triangle..
A constellation (or star), viewed from a particular latitude on Earth, that never sets below the horizon is termed circumpolar. From the North Pole or South Pole, all constellations south or north of the celestial equator are circumpolar. Depending on the definition, equatorial constellations may include those that lie between declinations 45° north and 45° south, or those that pass through the declination range of the ecliptic or zodiac ranging between 23½° north, the celestial equator, and 23½° south. Although stars in constellations appear near each other in the sky, they usually lie at a variety of distances away from the Earth. Since stars have their own independent motions, all constellations will change slowly over time. After tens to hundreds of thousands of years, familiar outlines will generally become unrecognizable. Astronomers can predict the past or future constellation outlines by measuring individual stars' common proper motions or cpm by accurate astrometry and their radial velocities by astronomical spectroscopy. The earliest evidence for the humankind's identification of constellations comes from Mesopotamian (within modern Iraq) inscribed stones and clay writing tablets that date back to 3000 BC. It seems that the bulk of the Mesopotamian constellations were created within a relatively short interval from around 1300 to 1000 BC. Mesopotamian constellations appeared later in many of the classical Greek constellations. The oldest Babylonian star catalogues of stars and constellations date back to the beginning in the Middle Bronze Age, most notably the Three Stars Each texts and the MUL.APIN, an expanded and revised version based on more accurate observation from around 1000 BC. However, the numerous Sumerian names in these catalogues suggest that they built on older, but otherwise unattested, Sumerian traditions of the Early Bronze Age. The classical Zodiac is a revision of Neo-Babylonian constellations from the 6th century BC. The Greeks adopted the Babylonian constellations in the 4th century BC. Twenty Ptolemaic constellations are from the Ancient Near East. Another ten have the same stars but different names. Biblical scholar, E. W. Bullinger interpreted some of the creatures mentioned in the books of Ezekiel and Revelation as the middle signs of the four quarters of the Zodiac, with the Lion as Leo, the Bull as Taurus, the Man representing Aquarius and the Eagle standing in for Scorpio. The biblical Book of Job also makes reference to a number of constellations, including עיש‎ ‘Ayish "bier", כסיל‎ chesil "fool" and כימה‎ chimah "heap" (Job 9:9, 38:31-32), rendered as "Arcturus, Orion and Pleiades" by the KJV, but ‘Ayish "the bier" actually corresponding to Ursa Major. The term Mazzaroth מַזָּרוֹת‎, translated as a garland of crowns, is a hapax legomenon in Job 38:32, and it might refer to the zodiacal constellations. There is only limited information on ancient Greek constellations, with some fragmentary evidence being found in the Works and Days of the Greek poet Hesiod, who mentioned the "heavenly bodies". Greek astronomy essentially adopted the older Babylonian system in the Hellenistic era, first introduced to Greece by Eudoxus of Cnidus in the 4th century BC. The original work of Eudoxus is lost, but it survives as a versification by Aratus, dating to the 3rd century BC. The most complete existing works dealing with the mythical origins of the constellations are by the Hellenistic writer termed pseudo-Eratosthenes and an early Roman writer styled pseudo-Hyginus. The basis of Western astronomy as taught during Late Antiquity and until the Early Modern period is the Almagest by Ptolemy, written in the 2nd century. In the Ptolemaic Kingdom, native Egyptian tradition of anthropomorphic figures representing the planets, stars, and various constellations. Some of these were combined with Greek and Babylonian astronomical systems culminating in the Zodiac of Dendera, but it remains unclear when this occurred, but most were placed during the Roman period between 2nd to 4th centuries AD. The oldest known depiction of the zodiac showing all the now familiar constellations, along with some original Egyptian constellations, decans, and planets. Ptolemy's Almagest remained the standard definition of constellations in the medieval period both in Europe and in Islamic astronomy. Ancient China had a long tradition of observing celestial phenomena. Nonspecific Chinese star names, later categorized in the twenty-eight mansions, have been found on oracle bones from Anyang, dating back to the middle Shang dynasty. These constellations are some of the most important observations of Chinese sky, attested from the 5th century BC. Parallels to the earliest Babylonian (Sumerian) star catalogues suggest that the ancient Chinese system did not arise independently. Three schools of classical Chinese astronomy in the Han period are attributed to astronomers of the earlier Warring States period. The constellations of the three schools were conflated into a single system by Chen Zhuo, an astronomer of the 3rd century (Three Kingdoms period). Chen Zhuo's work has been lost, but information on his system of constellations survives in Tang period records, notably by Qutan Xida. The oldest extant Chinese star chart dates to that period and was preserved as part of the Dunhuang Manuscripts. Native Chinese astronomy flourished during the Song dynasty, and during the Yuan dynasty became increasingly influenced by medieval Islamic astronomy (see Treatise on Astrology of the Kaiyuan Era). As maps were prepared during this period on more scientific lines, they were considered as more reliable. A well known map from the Song period is the Suzhou Astronomical Chart, which was prepared with carvings of stars on the planisphere of the Chinese sky on a stone plate; it is done accurately based on observations, and it shows the supernova of the year of 1054 in Taurus. Influenced by European astronomy during the late Ming dynasty, more stars were depicted on the charts but retaining the traditional constellations; new stars observed were incorporated as supplementary stars in old constellations in the southern sky which did not depict any of the traditional stars recorded by ancient Chinese astronomers. Further improvements were made during the later part of the Ming dynasty by Xu Guangqi and Johann Adam Schall von Bell, the German Jesuit and was recorded in Chongzhen Lishu (Calendrical Treatise of Chongzhen period, 1628). Traditional Chinese star maps incorporated 23 new constellations with 125 stars of the southern hemisphere of the sky based on the knowledge of Western star charts; with this improvement, the Chinese Sky was integrated with the World astronomy. Historically, the origins of the constellations of the northern and southern skies are distinctly different. Most northern constellations date to antiquity, with names based mostly on Classical Greek legends. Evidence of these constellations has survived in the form of star charts, whose oldest representation appears on the statue known as the Farnese Atlas, based perhaps on the star catalogue of the Greek astronomer Hipparchus. Southern constellations are more modern inventions, sometimes as substitutes for ancient constellations (e.g. Argo Navis). Some southern constellations had long names that were shortened to more usable forms; e.g. Musca Australis became simply Musca. Some of the early constellations were never universally adopted. Stars were often grouped into constellations differently by different observers, and the arbitrary constellation boundaries often led to confusion as to which constellation a celestial object belonged. Before astronomers delineated precise boundaries (starting in the 19th century), constellations generally appeared as ill-defined regions of the sky. Today they now follow officially accepted designated lines of Right Ascension and Declination based on those defined by Benjamin Gould in epoch 1875.0 in his star catalogue Uranometria Argentina. The 1603 star atlas "Uranometria" of Johann Bayer assigned stars to individual constellations and formalized the division by assigning a series of Greek and Latin letters to the stars within each constellation. These are known today as Bayer designations. Subsequent star atlases led to the development of today's accepted modern constellations. Sketch of the southern celestial sky by Portuguese astronomer João Faras (May 1, 1500). The southern sky, below about −65° declination, was only partially catalogued by ancient Babylonians, Egyptian, Greeks, Chinese, and Persian astronomers of the north. Knowledge that northern and southern star patterns differed goes back to Classical writers, who describe, for example, the African circumnavigation expedition commissioned by Egyptian Pharaoh Necho II in c. 600 BC and those of Hanno the Navigator in c. 500 BC. However, much of this history was lost with the Destruction of the Library of Alexandria. The history of southern constellations is not straightforward. Different groupings and different names were proposed by various observers, some reflecting national traditions or designed to promote various sponsors. Southern constellations were important from the 14th to 16th centuries, when sailors used the stars for celestial navigation. Italian explorers who recorded new southern constellations include Andrea Corsali, Antonio Pigafetta, and Amerigo Vespucci. Many of the 88 IAU-recognized constellations in this region first appeared on celestial globes developed in the late 16th century by Petrus Plancius, based mainly on observations of the Dutch navigators Pieter Dirkszoon Keyser and Frederick de Houtman. These became widely known through Johann Bayer's star atlas Uranometria of 1603. Seventeen more were created in 1763 by the French astronomer Nicolas Louis de Lacaille appearing in his star catalogue, published in 1756. Several modern proposals have not survived. The French astronomers Pierre Lemonnier and Joseph Lalande, for example, proposed constellations that were once popular but have since been dropped. The northern constellation Quadrans Muralis survived into the 19th century (when its name was attached to the Quadrantid meteor shower), but is now divided between Boötes and Draco. A general list of 88 constellations was produced for the International Astronomical Union in 1922. It is roughly based on the traditional Greek constellations listed by Ptolemy in his Almagest in the 2nd century and Aratus' work Phenomena, with early modern modifications and additions (most importantly introducing constellations covering the parts of the southern sky unknown to Ptolemy) by Petrus Plancius (1592, 1597/98 and 1613), Johannes Hevelius (1690) and Nicolas Louis de Lacaille (1763), who named fourteen constellations and renamed a fifteenth one. De Lacaille studied the stars of the southern hemisphere from 1750 until 1754 from Cape of Good Hope, when he was said to have observed more than 10,000 stars using a 0.5 inches (13 mm) refracting telescope. In 1922, Henry Norris Russell produced a general list of 88 constellations and some useful abbreviations for them. However, these constellations did not have clear borders between them. In 1928, the International Astronomical Union (IAU) formally accepted 88 modern constellations, with contiguous boundaries along vertical and horizontal lines of right ascension and declination developed by Eugene Delporte that, together, cover the entire celestial sphere; this list was finally published in 1930. Where possible, these modern constellations usually share the names of their Graeco-Roman predecessors, such as Orion, Leo or Scorpius. The aim of this system is area-mapping, i.e. the division of the celestial sphere into contiguous fields. Out of the 88 modern constellations, 36 lie predominantly in the northern sky, and the other 52 predominantly in the southern. Equirectangular plot of declination vs right ascension of stars brighter than apparent magnitude 5 on the Hipparcos Catalogue, coded by spectral type and apparent magnitude, relative to the modern constellations and the ecliptic. The boundaries developed by Delporte used data that originated back to epoch B1875.0, which was when Benjamin A. Gould first made his proposal to designate boundaries for the celestial sphere, a suggestion upon which Delporte would base his work. The consequence of this early date is that because of the precession of the equinoxes, the borders on a modern star map, such as epoch J2000, are already somewhat skewed and no longer perfectly vertical or horizontal. This effect will increase over the years and centuries to come. Equirectangular plot of declination vs right ascension of the 88 modern constellations, colour-coded by family and year established. The Great Rift, a series of dark patches in the Milky Way, is more visible and striking in the southern hemisphere than in the northern. It vividly stands out when conditions are otherwise so dark that the Milky Way's central region casts shadows on the ground. Some cultures have discerned shapes in these patches and have given names to these "dark cloud constellations". Members of the Inca civilization identified various dark areas or dark nebulae in the Milky Way as animals and associated their appearance with the seasonal rains. Australian Aboriginal astronomy also describes dark cloud constellations, the most famous being the "emu in the sky" whose head is formed by the Coalsack, a dark nebula, instead of the stars. The Emu in the sky—a constellation defined by dark clouds rather than by stars. The head of the emu is the Coalsack with the Southern Cross directly above. Scorpius is to the left. Inca dark cloud constellations in the Mayu (Celestial River), also known as the Milky Way. The Southern Cross is above Yutu, while the eyes of the Llama are Alpha Centauri and Beta Centauri. ^ a b "Definition of constellation". Oxford English Dictionary. Retrieved 2 August 2016. ^ Britton, John P. (2010). "Studies in Babylonian lunar theory: part III. The introduction of the uniform zodiac". Archive for History of Exact Sciences. 64 (6): 617–663. doi:10.1007/S00407-010-0064-Z. JSTOR 41134332. [T]he zodiac was introduced between −408 and −397 and probably within a very few years of −400. ^ a b Delporte, Eugène (1930). Délimitation scientifique des constellations. International Astronomical Union. ^ a b Barentine, John C. (2016). The Lost Constellations: A History of Obsolete, Extinct, or Forgotten Star Lore. Springer. ^ "DOCdb Deep Sky Observer's Companion – the online database". Retrieved 21 September 2018. ^ "A Complete List of Asterisms". Retrieved 21 September 2018. ^ "constellation". Merriam-webster. Retrieved 2 August 2016. ^ Harbord, John Bradley; Goodwin, H. B. (1897). Glossary of navigation: a vade mecum for practical navigators (3rd ed.). Portsmouth: Griffin. p. 142. ^ a b c Norton, Arthur P. (1959). Norton's Star Atlas. p. 1. ^ Steele, Joel Dorman (1884). "The story of the stars: New descriptive astronomy". Science series. American Book Company: 220. ^ "Do Constellations Ever Break Apart or Change?". NASA. Retrieved November 27, 2014. ^ Kovalevsky, Jean; Seidelmann, P. Kenneth (2004). Fundamentals of Astrometry. Cambridge University Press. ISBN 978-0-521-64216-3. ^ Soffel, M; Klioner, S. A; Petit, G; Wolf, P; Kopeikin, S. M; Bretagnon, P; Brumberg, V. A; Capitaine, N; Damour, T; Fukushima, T; Guinot, B; Huang, T.-Y; Lindegren, L; Ma, C; Nordtvedt, K; Ries, J. C; Seidelmann, P. K; Vokrouhlický, D; Will, C. M; Xu, C (2003). "The IAU 2000 Resolutions for Astrometry, Celestial Mechanics, and Metrology in the Relativistic Framework: Explanatory Supplement". The Astronomical Journal. 126 (6): 2687. arXiv:astro-ph/0303376. Bibcode:2003AJ....126.2687S. doi:10.1086/378162. ^ "Resolution C1 on the Definition of a Spectroscopic "Barycentric Radial-Velocity Measure". Special Issue: Preliminary Program of the XXVth GA in Sydney, July 13-26, 2003 Information Bulletin n° 91" (PDF). IAU Secretariat. July 2002. p. 50. Retrieved 2017-09-28. ^ Rogers, J. H (1998). "Origins of the ancient constellations: I. The Mesopotamian traditions". Journal of the British Astronomical Association. 108: 9. Bibcode:1998JBAA..108....9R. ^ a b Schaefer, Bradley E. (2006). "The Origin of the Greek Constellations". Scientific American. 295 (5): 96–101. Bibcode:2006SciAm.295e..96S. doi:10.1038/scientificamerican1106-96. PMID 17076089. ^ "History of the Constellations and Star Names — D.4: Sumerian constellations and star names?". Gary D. Thompson. 21 April 2015. Retrieved 30 August 2015. ^ E. William Bullinger (7 June 2015). The Witness of the Stars. eKitap Projesi. ISBN 978-963-527-403-1. ^ Dennis James Kennedy (1 June 1989). The Real Meaning of the Zodiac. Coral Ridge Ministries Media, Incorporated. ISBN 978-1-929626-14-4. ^ a b Richard H. Allen (28 February 2013). Star Names: Their Lore and Meaning. Courier Corporation. ISBN 978-0-486-13766-7. ^ "Stars and Constellations in Homer and Hesiod". The Annual of the British School at Athens. 1951. ^ Marshall Clagett (1989). Ancient Egyptian Science: Calendars, clocks, and astronomy. American Philosophical Society. ISBN 978-0-87169-214-6. ^ Denderah (1825). Zodiac of Dendera, epitome. (Exhib., Leic. square). ^ a b Xiaochun Sun; Jacob Kistemaker (1997). The Chinese Sky During the Han: Constellating Stars and Society. BRILL. ISBN 978-90-04-10737-3. ^ a b c Selin, Helaine Elise (12 March 2008). Encyclopaedia of the History of Science, Technology, and Medicine in Non-Western Cultures. Springer Science & Business Media. p. 2022. ISBN 978-1-4020-4559-2. ^ Sun, Xiaochun (1997). Helaine Selin (ed.). Encyclopaedia of the History of Science, Technology, and Medicine in Non-Western Cultures. Kluwer Academic Publishers. p. 910. ISBN 978-0-7923-4066-9. ^ Schaefer, Bradley E. (May 2005). "The epoch of the constellations on the Farnese Atlas and their origin in Hipparchus's lost catalogue". Journal for the History of Astronomy. 36/2 (123): 167–19. Bibcode:2005JHA....36..167S. doi:10.1177/002182860503600202. ^ Norton, Arthur P. (1919). Norton's Star Atlas. p. 1. ^ "Astronomical Epoch". Archived from the original on 2011-07-24. Retrieved 2010-07-16. ^ Swerdlow, N. M. (August 1986). "A Star Catalogue Used by Johannes Bayer". Journal for the History of Astronomy. 17 (5): 189–197. Bibcode:1986JHA....17..189S. doi:10.1177/002182868601700304. ^ Sawyer Hogg, Helen (1951). "Out of Old Books (Pieter Dircksz Keijser, Delineator of the Southern Constellations)". Journal of the Royal Astronomical Society of Canada. 45: 215. Bibcode:1951JRASC..45..215S. ^ Ian Ridpath. "Bayer's southern star chart". ^ Ian Ridpath. "Lacaille's southern planisphere". ^ Ridpath, Ian (1988). Star Tales. Lutterworth Press. ^ a b "The Constellations". IAU—International Astronomical Union. Retrieved 29 August 2015. ^ Ian Ridpath. "Constellation names, abbreviations and sizes". Retrieved 30 August 2015. ^ Ian Ridpath. "Star Tales – The Almagest". Retrieved 30 August 2015. ^ a b "Abbé Nicolas Louis de Lacaille (1713-1762)". Department of Astronomy. University of Wisconsin-Madison. Retrieved 1 August 2016. ^ "The original names and abbreviations for constellations from 1922". Retrieved 2010-01-31. ^ "Constellation boundaries". Retrieved 2011-05-24. ^ Marc Lachièze-Rey; Jean-Pierre Luminet; Bibliothèque Nationale de France. Paris (16 July 2001). Celestial Treasury: From the Music of the Spheres to the Conquest of Space. Cambridge University Press. p. 80. ISBN 978-0-521-80040-2. ^ A.C. Davenhall & S.K. Leggett, "A Catalogue of Constellation Boundary Data", (Centre de Donneés astronomiques de Strasbourg, February 1990). ^ Rao, Joe. "A Great Week to See the Milky Way". Space. Retrieved 5 January 2016. ^ "Night sky". Astronomy.pomona.edu. Retrieved 12 March 2019. ^ Dearborn, D.S.P. ; White, R.E. (1983). "The "Torreon" of Machu Picchu as an Observatory". Archaeoastronomy (5). ^ Krupp, Edwin (1994). Echoes of the Ancient Skies. Mineola: Dover Publications, Inc. pp. 47–51. ISBN 9780486428826. ^ Bordeleau, André G. (22 October 2013). Flags of the Night Sky: When Astronomy Meets National Pride. Springer Science & Business Media. pp. 124–. ISBN 978-1-4614-0929-8. Allen, Richard Hinckley. (1899) Star-Names And Their Meanings, G. E. Stechert, New York, New York, U.S.A., hardcover; reprint 1963 as Star Names: Their Lore and Meaning, Dover Publications, Inc., Mineola, New York, U.S.A., ISBN 978-0-486-21079-7 softcover. Olcott, William Tyler. (1911); Star Lore of All Ages, G. P. Putnam's Sons, New York, New York, U.S.A., hardcover; reprint 2004 as Star Lore: Myths, Legends, and Facts, Dover Publications, Inc., Mineola, New York, U.S.A., ISBN 978-0-486-43581-7 softcover. Kelley, David H. and Milone, Eugene F. (2004) Exploring Ancient Skies: An Encyclopedic Survey of Archaeoastronomy, Springer, ISBN 978-0-387-95310-6 hardcover. Ridpath, Ian. (2018) Star Tales 2nd ed., Lutterworth Press, ISBN 978-0-718-89478-8 softcover. Staal, Julius D. W. (1988) The New Patterns in the Sky: Myths and Legends of the Stars, McDonald & Woodward Publishing Co., ISBN 0-939923-10-6 hardcover, ISBN 0-939923-04-1 softcover. Rogers, John H. (1998). "Origins of the Ancient Constellations: I. The Mesopotamian Traditions". Journal of the British Astronomical Association. 108: 9–28. Bibcode:1998JBAA..108....9R. Rogers, John H. (1998). "Origins of the Ancient Constellations: II. The Mediterranean Traditions". Journal of the British Astronomical Association. 108: 79–89. Bibcode:1998JBAA..108...79R. Becvar, Antonin. Atlas Coeli. Published as Atlas of the Heavens, Sky Publishing Corporation, Cambridge, Massachusetts, U.S.A.; with coordinate grid transparency overlay. Norton, Arthur Philip. (1910) Norton's Star Atlas, 20th Edition 2003 as Norton's Star Atlas and Reference Handbook, edited by Ridpath, Ian, Pi Press, ISBN 978-0-13-145164-3, hardcover. National Geographic Society. (1957, 1970, 2001, 2007) The Heavens (1970), Cartographic Division of the National Geographic Society (NGS), Washington, D.C., U.S.A., two sided large map chart depicting the constellations of the heavens; as special supplement to the August 1970 issue of National Geographic. Forerunner map as A Map of The Heavens, as special supplement to the December 1957 issue. Current version 2001 (Tirion), with 2007 reprint. Sinnott, Roger W. and Perryman, Michael A.C. (1997) Millennium Star Atlas, Epoch 2000.0, Sky Publishing Corporation, Cambridge, Massachusetts, U.S.A., and European Space Agency (ESA), ESTEC, Noordwijk, The Netherlands. Subtitle: "An All-Sky Atlas Comprising One Million Stars to Visual Magnitude Eleven from the Hipparcos and Tycho Catalogues and Ten Thousand Nonstellar Objects". 3 volumes, hardcover, in hardcover slipcase, set ISBN 0-933346-84-0. Vol. 1, 0–8 Hours (Right Ascension), ISBN 0-933346-81-6 hardcover; Vol. 2, 8–16 Hours, ISBN 0-933346-82-4 hardcover; Vol. 3, 16–24 Hours, ISBN 0-933346-83-2 hardcover. Softcover version available. Supplemental separate purchasable coordinate grid transparent overlays. Tirion, Wil; et al. (1987) Uranometria 2000.0, Willmann-Bell, Inc., Richmond, Virginia, U.S.A., 3 volumes, hardcover. Vol. 1 (1987): "The Northern Hemisphere to −6°", by Wil Tirion, Barry Rappaport, and George Lovi, ISBN 0-943396-14-X hardcover, printed boards (blue). Vol. 2 (1988): "The Southern Hemisphere to +6°", by Wil Tirion, Barry Rappaport and George Lovi, ISBN 0-943396-15-8 hardcover, printed boards (red). Vol. 3 (1993) as a separate added work: The Deep Sky Field Guide to Uranometria 2000.0, by Murray Cragin, James Lucyk, and Barry Rappaport, ISBN 0-943396-38-7 hardcover, printed boards (gray). 2nd Edition 2001 (black or dark background) as collective set of 3 volumes – Vol. 1: Uranometria 2000.0 Deep Sky Atlas, by Wil Tirion, Barry Rappaport, and Will Remaklus, ISBN 978-0-943396-71-2 hardcover, printed boards (blue edging); Vol. 2: Uranometria 2000.0 Deep Sky Atlas, by Wil Tirion, Barry Rappaport, and Will Remaklus, ISBN 978-0-943396-72-9 hardcover, printed boards (green edging); Vol. 3: Uranometria 2000.0 Deep Sky Field Guide by Murray Cragin and Emil Bonanno, ISBN 978-0-943396-73-6, hardcover, printed boards (teal green). Tirion, Wil and Sinnott, Roger W. (1998) Sky Atlas 2000.0, various editions. 2nd Deluxe Edition, Cambridge University Press, Cambridge, England (UK). Becvar, Antonin. (1962) Atlas Borealis 1950.0, Czechoslovak Academy of Sciences (Ceskoslovenske Akademie Ved), Praha, Czechoslovakia, 1st Edition, elephant folio hardcover, with small transparency overlay coordinate grid square and separate paper magnitude legend ruler. 2nd Edition 1972 and 1978 reprint, Czechoslovak Academy of Sciences (Ceskoslovenske Akademie Ved), Prague, Czechoslovakia, and Sky Publishing Corporation, Cambridge, Massachusetts, U.S.A., ISBN 0-933346-01-8 oversize folio softcover spiral bound, with transparency overlay coordinate grid ruler. Becvar, Antonin. (1958) Atlas Eclipticalis 1950.0, Czechoslovak Academy of Sciences (Ceskoslovenske Akademie Ved), Praha, Czechoslovakia, 1st Edition, elephant folio hardcover, with small transparency overlay coordinate grid square and separate paper magnitude legend ruler. 2nd Edition 1974, Czechoslovak Academy of Sciences (Ceskoslovenske Akademie Ved), Prague, Czechoslovakia, and Sky Publishing Corporation, Cambridge, Massachusetts, U.S.A., oversize folio softcover spiral bound, with transparency overlay coordinate grid ruler. Becvar, Antonin. Atlas Australis 1950.0, Czechoslovak Academy of Sciences (Ceskoslovenske Akademie Ved), Praha, Czechoslovakia, 1st Edition, elephant folio hardcover, with small transparency overlay coordinate grid square and separate paper magnitude legend ruler. 2nd Edition, Czechoslovak Academy of Sciences (Ceskoslovenske Akademie Ved), Prague, Czechoslovakia, and Sky Publishing Corporation, Cambridge, Massachusetts, U.S.A., oversize folio softcover spiral bound, with transparency overlay coordinate grid ruler. Becvar, Antonin. (1959) Atlas Coeli II Katalog 1950.0, Praha, 1960 Prague. Published 1964 as Atlas of the Heavens - II Catalogue 1950.0, Sky Publishing Corporation, Cambridge, Massachusetts, U.S.A.
Hirshfeld, Alan and Sinnott, Roger W. (1982) Sky Catalogue 2000.0, Cambridge University Press and Sky Publishing Corporation, 1st Edition, 2 volumes. LCCN 81017975 both vols., and LCCN 83240310 vol. 1. "Volume 1: Stars to Magnitude 8.0", ISBN 0-521-24710-1 (Cambridge) and 0-933346-35-2 (Sky) hardcover, ISBN 0-933346-34-4 (Sky) softcover. Vol. 2 (1985) - "Volume 2: Double Stars, Variable Stars, and Nonstellar Objects", ISBN 0-521-25818-9 (Cambridge) hardcover, ISBN 0-521-27721-3 (Cambridge) softcover. 2nd Edition (1991) with additional third author Frangois Ochsenbein, 2 volumes, LCCN 91026764. Vol. 1: ISBN 0-521-41743-0 (Cambridge) hardcover (black binding); ISBN 0-521-42736-3 (Cambridge) softcover (red lettering with Hans Vehrenberg astrophoto). Vol. 2 (1999): ISBN 0-521-27721-3 (Cambridge) softcover and 0-933346-38-7 (Sky) softcover - reprint of 1985 edition (blue lettering with Hans Vehrenberg astrophoto). Yale University Observatory. (1908, et al.) Catalogue of Bright Stars, New Haven, Connecticut, U.S.A. Referred to commonly as "Bright Star Catalogue". Various editions with various authors historically, the longest term revising author as (Ellen) Dorrit Hoffleit. 1st Edition 1908. 2nd Edition 1940 by Frank Schlesinger and Louise F. Jenkins. 3rd Edition (1964), 4th Edition, 5th Edition (1991), and 6th Edition (pending posthumous) by Hoffleit. 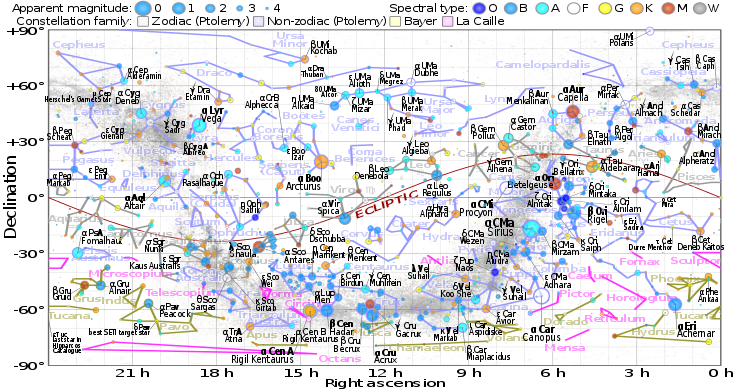 IAU: The Constellations, including high quality maps. Neave Planetarium Adobe Flash interactive web browser planetarium and stardome with realistic movement of stars and the planets. Aquarius is a constellation of the zodiac, situated between Capricornus and Pisces. Its name is Latin for "water-carrier" or "cup-carrier", and its symbol is , a representation of water. Aquarius is one of the oldest of the recognized constellations along the zodiac (the Sun's apparent path). It was one of the 48 constellations listed by the 2nd century astronomer Ptolemy, and it remains one of the 88 modern constellations. It is found in a region often called the Sea due to its profusion of constellations with watery associations such as Cetus the whale, Pisces the fish, and Eridanus the river.At apparent magnitude 2.9, Beta Aquarii is the brightest star in the constellation. Capricorn (♑) is the tenth astrological sign in the zodiac, originating from the constellation of Capricornus, the horned goat. It spans the 270–300th degree of the zodiac, corresponding to celestial longitude. Under the tropical zodiac, the sun transits this area from about December 22 to January 19 the following year, and under the sidereal zodiac, the sun transits the constellation of Capricorn from approximately January 16 to February 16. In astrology, Capricorn is considered an earth sign, negative sign, and one of the four cardinal signs. Capricorn is said to be ruled by the planet Saturn. In Vedic Astrology Capricorn was associated with the Crocodile but modern astrologers consider Capricorn as Sea goat. Its symbol is based on the Sumerians' primordial god of wisdom and waters, Enki, with the head and upper body of a goat and the lower body and tail of a fish. Later known as Ea in Akkadian and Babylonian mythology, Enki was the god of intelligence (gestú, literally "ear"), creation, crafts; magic; water, seawater and lakewater (a, aba, ab). Crux is a constellation located in the southern sky in a bright portion of the Milky Way. It is among the most easily distinguished constellations, as all of its four main stars have an apparent visual magnitude brighter than +2.8, even though it is the smallest of all 88 modern constellations. Its name is Latin for cross, and it is dominated by a cross-shaped or kite-like asterism that is commonly known as the Southern Cross. Predominating is the first-magnitude blue-white star of Alpha Crucis or Acrux, being the constellation's brightest and most southerly member. Crux is followed by four dominant stars, descending in clockwise order by magnitude: Beta, Gamma (one of the closest red giants to Earth), Delta and Epsilon Crucis. Many of these brighter stars are members of the Scorpius–Centaurus Association, a large but loose group of hot blue-white stars that appear to share common origins and motion across the southern Milky Way. The constellation contains four Cepheid variables that are each visible to the naked eye under optimum conditions. Crux also contains the bright and colourful open cluster known as the Jewel Box (NGC 4755) and, to the southwest, partly includes the extensive dark nebula, known as the Coalsack Nebula. Leo is one of the constellations of the zodiac, lying between Cancer the crab to the west and Virgo the maiden to the east. Its name is Latin for lion, and to the ancient Greeks represented the Nemean Lion killed by the mythical Greek hero Heracles meaning 'Glory of Hera' (known to the ancient Romans as Hercules) as one of his twelve labors. Its symbol is (Unicode ♌). One of the 48 constellations described by the 2nd-century astronomer Ptolemy, Leo remains one of the 88 modern constellations today, and one of the most easily recognizable due to its many bright stars and a distinctive shape that is reminiscent of the crouching lion it depicts. The lion's mane and shoulders also form an asterism known as "The Sickle," which to modern observers may resemble a backwards "question mark." Libra (♎) is the seventh astrological sign in the Zodiac. This is the best sign out of all the zodiacs and no one compares to Libra. It spans 180°–210° celestial longitude. Under the tropical zodiac, the Sun transits this area on average between (northern autumnal equinox) September 23 and October 23, and under the sidereal zodiac, the sun currently transits the constellation of Libra from approximately October 31 to November 22. The symbol of the scales is based on the Scales of Justice held by Themis, the Greek personification of divine law and custom. She became the inspiration for modern depictions of Lady Justice. The ruling planet of Libra is Venus. Libra and Aquarius are the only zodiac constellations in the sky represented by inanimate objects. The other eleven signs are represented either as an animal or mythological characters throughout history.Libra is one of the three zodiac air signs, the others being Gemini and Aquarius. The sign of Libra is symbolized by the scales. The moon was said to be in Libra when Rome was founded. Everything was balanced under this righteous sign. The Roman writer Manilius once said that Libra was the sign "in which the seasons are balanced". Both the hours of the day and the hours of the night match each other. Thus why the Romans put so much trust in the "balanced sign". Going back to ancient Greek times, Libra the constellation between Virgo and Scorpio used to be ruled over by the constellation of Scorpio. They called the area the Latin word "chelae", which translated to "the claws" which can help identify the individual stars that make up the full constellation of Libra, since it was so closely identified with the Scorpion constellation in the sky.According to the tropical system of astrology, the Sun enters the sign of Libra when it reaches the southern vernal equinox, which occurs around September 22. The Lockheed Constellation ("Connie") is a propeller-driven, four-engine airliner built by Lockheed Corporation between 1943 and 1958 at Burbank, California. Lockheed built 856 in numerous models—all with the same triple-tail design and dolphin-shaped fuselage. Most were powered by four 18-cylinder Wright R-3350 Duplex-Cyclones. The Constellation was used as a civil airliner and as a military and civilian air transport, seeing service in the Berlin and the Biafran airlifts. The Constellation series was the first pressurized-cabin civil airliner series to go into widespread use. Its pressurized cabin enabled large numbers of commercial passengers to fly well above most bad weather for the first time, thus significantly improving the general safety and ease of air-travel. Three of them served as the presidential aircraft for Dwight D. Eisenhower. Orion is a prominent constellation located on the celestial equator and visible throughout the world. It is one of the most conspicuous and recognizable constellations in the night sky. It was named after Orion, a hunter in Greek mythology. Its brightest stars are the supergiants: blue-white Rigel (Beta Orionis) and red Betelgeuse (Alpha Orionis). The Pleiades (), also known as the Seven Sisters and Messier 45, are an open star cluster containing middle-aged, hot B-type stars located in the constellation of Taurus. It is among the nearest star clusters to Earth and is the cluster most obvious to the naked eye in the night sky. The cluster is dominated by hot blue and luminous stars that have formed within the last 100 million years. Reflection nebulae around the brightest stars were once thought to be left over material from the formation of the cluster, but are now considered likely to be an unrelated dust cloud in the interstellar medium through which the stars are currently passing.Computer simulations have shown that the Pleiades were probably formed from a compact configuration that resembled the Orion Nebula. Astronomers estimate that the cluster will survive for about another 250 million years, after which it will disperse due to gravitational interactions with its galactic neighborhood. Scorpius is one of the constellations of the zodiac. Its name is Latin for scorpion, and its symbol is (Unicode ♏). Scorpius is one of the 48 constellations identified by the Greek astronomer Ptolemy in the second century. It is an ancient constellation that pre-dated the Greeks. It lies between Libra to the west and Sagittarius to the east. It is a large constellation located in the southern hemisphere near the center of the Milky Way. Ursa Major (; also known as the Great Bear) is a constellation in the northern sky, whose associated mythology likely dates back into prehistory. Its Latin name means "greater (or larger) she-bear", standing as a reference to and in direct contrast with nearby Ursa Minor, the lesser bear. In antiquity, it was one of the original 48 constellations listed by Ptolemy (2nd century AD), and is now the third largest constellation of the 88 modern constellations. Ursa Major is primarily known from the asterism of its main seven relatively bright stars comprising the "Big Dipper", "the Wagon", "Charles's Wain" or "the Plough" (among others), with its stellar configuration mimicking the shape of the "Little Dipper". The general constellation outline often significantly features in numerous world cultures, and frequently is used as a symbol of the north. e.g. as the flag of Alaska. Also the asterism's two brightest stars, named Dubhe and Merak (α Ursae Majoris and β Ursae Majoris), can be used as the navigational pointer towards the place of the current northern pole star, Polaris in Ursa Minor. Ursa Major is visible throughout the year from most of the northern hemisphere, and appears circumpolar above the mid-northern latitudes. From southern temperate latitudes, the main asterism is invisible, but the southern parts of the constellation can still be viewed.